Oct 2002. May Ballantyne (nee Cuthbertson ) sent in this class photograph. ".....I lived at 106 Bernard St........ I love your site reliving old memories. I've been in Canada since 1965 and live in Oshawa, Ontario, about 25mls east of Toronto. Thanks for the memories of Bridgeton and for letting me be part of your website." Webmaister: thanks May, I love seeing the old 'coconut mats' again....we all remember them! Please contact webmaister if you can put a name to a face or can tell a tale from this class..
Nancy Geddes was my best pal then .I know she is in Canada but I haven't seen her since about 1968. It would be great if she sees this and contacts me....once again I must thank you for your website"
"..... Just thought I'd make a correction as to who the 6th person in the top row of that picture. It is me, Shirley Robb (nee Crainey). The fifth person in the top row is Margaret Mathieson. 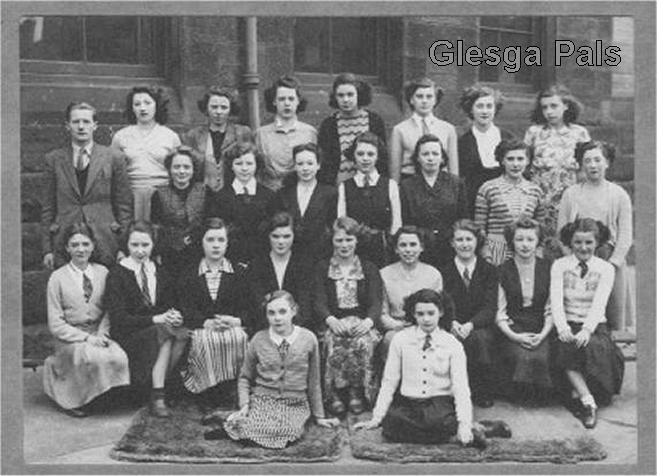 Jean Hudson, in the front row should be able to identify Moira Gordon since they were pals. Thank's a million for giving me back my picture I lost over 45 years ago. It brought back some wonderful memories. Looking at the class picture just jogged my memory as to the names of two of the other girls in the picture. In the seond row # 4 is Moira Gordon. In the fourth row #4 is May Coulter. Thanks again May Cuthbertson for the picture." "...Hi OorWull,webmaister. the friend I found after 35 years thanks to your website was May Cuthbertson/Ballantyne from Oshawa. When I found out she was in Oshawa, I only had to call the operator, ask for the phone #, and called her right away. Your website is great I love it! I'm 67 years old, just getting into this WWW stuff, so I'll be a regular, the more you use it (You know what I mean) everything! My name was Nancy Geddes (now MacLaren) I was born in the Gallowgate, lived in Heron St since I was about 4 (1940). I went to Queen Mary St School, lived in Birmingham for a couple of years after the war, and went to John St Sen Sec. till I left in 1950 or thereabouts. I Worked at Templetons Carpet Factory (1Yr) and then went to East Kilbride Dairy Farmers in Silvergrove St.( 5 Yrs) I came to canada in 1957 when I was 20. I have a son Craig 42 and a daughter Lauren 44. 4 grandchildren. Meaghan 13, Alexander 11 (My sons kids) and Bradley 11 and Ayden 6( my daughters kids ) My husband was Lauchlan MacLaren born 1937 came from Rutherglen, (Died 1989) came to Canada when he was 18. ( Hugs and Kisses ) from Nancy to Wull oor webmaister! Mary Cuthbertson is the person ah managed tae get in touch wi efter awe these years thanks tae GlescaPals! Noo jist anither wee thing thote ah might tell ye. Ah met an auld pal oh mine jist over a year ago an told her ah hid seen her photie oan GlescaPals. Looks like her Grandaughter gote in touch an gave her name . Rumford St 1944/45. Margaret McAleese. 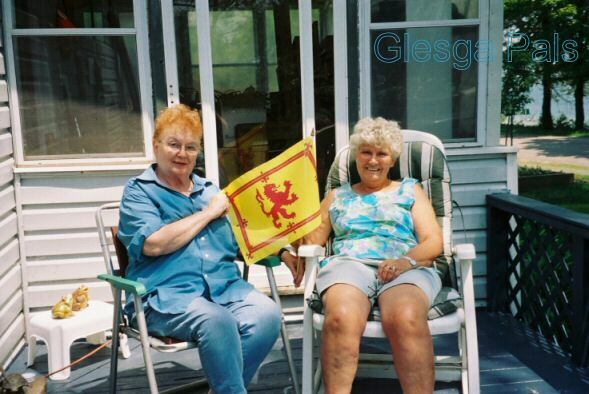 She lived up the next close fae yer Grannie, Webmaister oan the corner o' Reid St an Franklin St.
Hi Webmaister I wonder if you would print this picture of Nancy McLaren nee Geddes and me. We were pals at John St.School and after we left, till she came to Canada in the late 50s I came in 1965 and we met once or twice before losing touch. Thanks for getting the guestbook up and running again . Cheers May......p.s donation on its way!